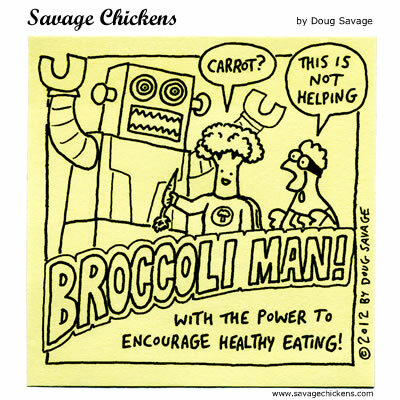 I love that Broccoli Man is so useless he only encourages villains to eat healthy. This just in: Broccoli Man is dead, autopsy results indicate crushing by evil robot. But on a lighter note, his cholesterol was extremely low. Now back to sports with Biff Swearington. Superhero idea: Bring back the spider costume… Arachno-Chicken!